What's For Tea? : Cookbook Challenge - Apricot Jam - 2 - $ - V - ! 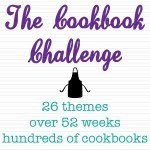 The Cookbook Challenge is back again in 2011 hooray! This year is a little different in that it's a fortnightly activity; lots of people found it very hard to catch up once they missed couple of weeks in 2010 - myself included. If you would like to play this year you can sign up over here. Thanks to Penny, we are adding our own links to a special group rather than April doing a wrap up once a week throughout 2011. A big shout out to Shellie too for designing the great new logo! When my friend Snake moved house recently we were a bit sad about the prospect of no more figs from his garden for making jam. But his new house also has loads of fruit trees and a veggie patch! So far I have had beautiful homegrown silverbeet, dill and parsley, so when he asked me would I like a bag of apricots it really was a no brainer. Naturally when making the basics I turn to Dame Stephanie's The Cook's Companion and in this case it was for a jam recipe. I did a few things differently which you may or may not choose to do too. Firstly, I took the apricots to the pub, where they got trod on and some got a bit squished. Then I left the squished ones in the bag on a 34C degree day and forgot all about them. The 'one bad apple' saying applies here, so I had to go and buy some more apricots to make up the recipe weight. I also added scraped in a vanilla bean and left the pod in the pot while the fruit reduced. Regarding the kernels mentioned below I am not entirely sure that they are meant to end up like they did, but I am entirely sure that I deviated a fair bit from the method. Dame Stephanie says to put the stones in a napkin and hit them with a meat mallet. I put mine between some paper towel and belted them with a hammer. Therefore the kernels got quite mashed and floated all round the jam mixture when I added them. I ended up picking them out before bottling so maybe someone who knows better could leave us a comment about this? Jars for bottling - you can read how to sterilise them over here. Cut the apricots into quarters and remove the stones, keeping half of them. Add the fruit, water and lemon juice to a large pot and bring slowly to the boil. Simmer for 20 minutes or a bit longer if the flesh hasn't broken down enough for your liking. Meanwhile put the reserved stones between a napkin and smash them open with a meat mallet to extract the kernel. Have a smell of the kernels - remind you anything? Amaretto or marzipan perhaps? Put the sugar and kernels in a cast iron pot or a tray and place it in the oven until it is 'hand hot'. This will take about 15 minutes. Add the sugar to the pot and stir until dissolved. Boil rapidly for about 15 minutes. Be VERY careful if you stir it as it might spit and hot sugar burns do not tickle. Pop a spoon of jam on a cold saucer, cool in the fridge for a minnie or two and then run your finger through it. If the jam stays in two halves then it's ready to set, if not keep checking every 5 or so minutes. Bottle the jam while it's hot and then spend the rest of the arvo cleaning the sticking kitchen as it will have ended up everywhere. Serve on hot toast with lashings of butter. I always leave the kernels in the jam, intact. They are completely edible and taste deliciously almondy! Well done on making jam, and apricot would have to be one of my favourites! if you want a bigger logo let me know! Thanks for confirming the kernel use ETL! I shall leave them in next time. It seems to be so delicious and i wanna taste it..Looks awesome..
Just found your blog! Love it!!! It looks Yummy!!! I have tried this dish & it was awesome. Thanks for it. Nice dish. I want to taste it asap. Keep up the good work. Looks so good! I love fresh peaches :) I used to preserve them by batches for baking before I got too busy managing a Chinese Restaurant in Capalaba area. You just inspired me to try this recipe for the kids, thanks! In the interests of community and cooking, What's For Tea? is all about sharing - recipes, places to eat, culinary tips and anything else relevant to food and beverage consumption. 1= the ability to chop and set a timer. 5= you probably own your own mini blow torch for caramelizing Creme Brulee. The idea is to start where you are comfortable and build your confidence as your cooking improves. $$$= AUD11.00 or more per head. V = safe for vegetarian consumption.
! = need to do some preparation before you get started, for example, soak some pulses overnight or marinate some meat. Kulinary Karma states that if you use one of our recipes then you email us one of your faves to add to the cooking/sharing chain.